This is just stunning, love the card you have used, the texture is just a perfect background for the beautiful panels and the butterfly is a fabulous topper. Beautiful card, Sylvie. Those pan pastels give a lovely effect. Beautiful card Sylvie... enjoy your trip and its really damp and cold here in the UK this morning. Absolutely stunning Sylvie. It's not 21 degrees here, not even close unfortunately ! What nice subtle colours... and I love the way you used this stamp. I have that stamp as well and never would I have thought of being so creative. See, that is what Less is More does to us. And by the way, I would be a double millionairess if I didn't spend so much on craft. In Indonesia, where we stay presently, I land up paying three to four times the price. Temptation always takes the better of me. Thanks for becoming my follower... I am trying to return the kind favour but for some reason blogger is playing up. I will try later. This is superb Sylvie.. That image is perfect for spreading across the three squares. Hi Sylvie, lovely lovely card, I do like how you've split the image up into 3 parts. The Panpastels background looks great too. My friend told me about Geo Caching, sounds fun and interesting. Enjoy yourself. I'd definitely swap weather with you today, it's starting to get veeeeery chilly here, lol. Those pastels are a lovely backdrop! Beautiful card Sylvie! Love the stamp you've used and the soft colours of the Pan Pastels. The weather here is rubbish - just as you know it is, lol!! Your card is gorgeous Sylvie. The delicate colours of the Pan Pastels make a lovely backdrop for the stamp. Hi Sylvie! 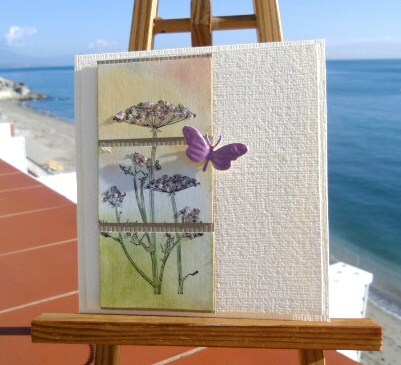 Beautiful card you've made this week! Looks like you all have beautiful weather too. We've had a bit of a cold snap here in "sunny" Florida! To some people I guess 45°F is not "cold", but to me it is!! Oh what a beautiful, gorgeous card Sylvie. WOW! GORGEOUS card Sylvie and I just love the colors you used on the flowers so soft! Love your card photos with the beautiful background! Thank you for stopping by today!! Weather here a tad chilly today (Tuesday because I am late catching up with you!!!). Hubby had to scrape the windscreen of his car before he could pull off the drive!!! Eeeekkk!!! Loving your card very much. The chopped up image is a great look. Hearing a lot about these pan pastels. Might have to add them to my ever growing list!! Wow ... this is so beautiful! This is beautiful. That image looks wonderful against your beautiful pastel background. Fab colors. ann y. Beautiful card, love the textured card really adds to the overall look. Just beautiful! Love the colours, stamp and the whole thing looks so elegant!